It didn’t take long for word to spread about a new Golden Valley restaurant. Lat14 was fully booked for its opening day Sept. 18. Owner and chef Ann Ahmed started Lat14 with her husband, Tarique. Ahmed says their decision to open a restaurant in Golden Valley (at the site of a former Perkins off Highway 55) sort of happened by accident. “We drove past this on our errands and what not, and he said, ‘Did you notice that this Perkins is up for sale?’ and I was like, ‘Well, this is a great location,'” said Ahmed. For Golden Valley’s restaurant scene, Lat14 is something new, adding distinct flavors of Southeast Asia. Lat14 is named after the 14th parallel north latitude, which touches the countries of Laos, Vietnam, Cambodia, the Philippines and Thailand. 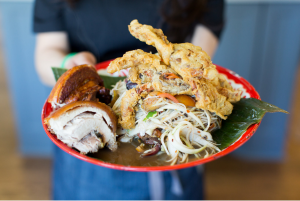 Flavors from those countries are found on the menu, featuring everything from a Filipino-roasted pork belly to a Lao-style stew to a whole fried red snapper. The restaurant is currently open for dinner, but look for it to begin serving lunch starting Oct. 1. Ahmed says the time was right to start a new restaurant venture. Her other restaurant gained acclaim in Brooklyn Park. Lemon Grass Thai Cuisine opened in 2005. As a mother of 4-year-old twins, Ahmed says raising a family helped prepared her for the juggling act of running a second restaurant. “If I can handle those two kids, this is a lot easier than 4-year-old twins for sure,” she said. Ahmed was born in Laos and immigrated to the United States with her family at age 4. Her cooking inspiration stems from her childhood learning her grandmother and her mother. As a fan of all different kinds of foods, Ahmed says don’t be afraid to step outside your comfort zone.